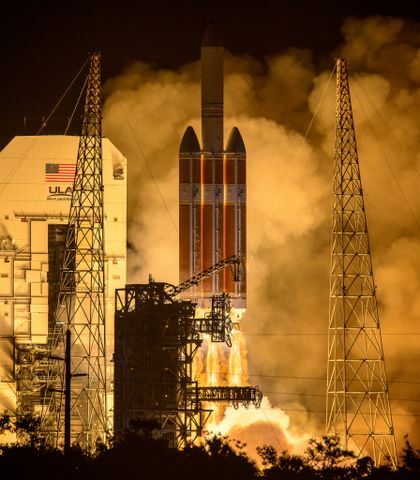 When NASA’s next-generation heavy-lift rocket, the Space Launch System (SLS) lifts off, it will feature familiar-looking twin solid rocket motor boosters similar in appearance to the white four-segment boosters that helped propel the Space Shuttle into orbit. 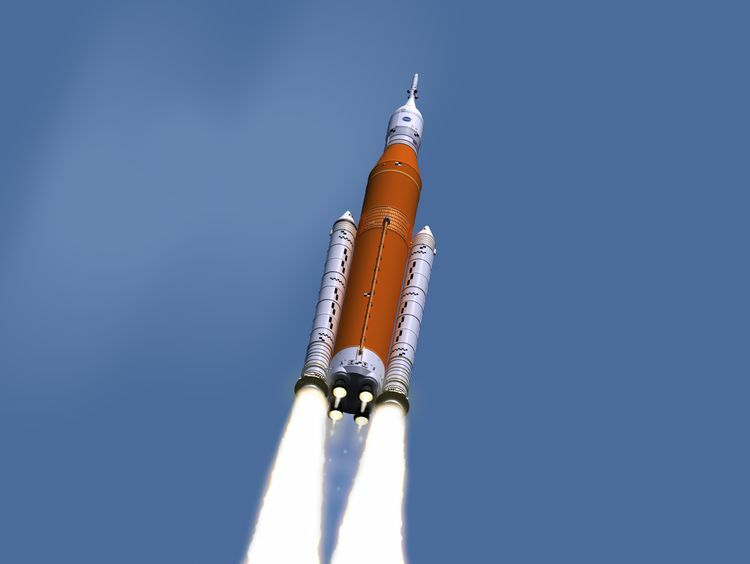 This rendering depicts what NASA's Space Launch System will look like during launch. Each SLS booster consists of five solid rocket motor segments along with forward and aft assemblies as well as other flight components. 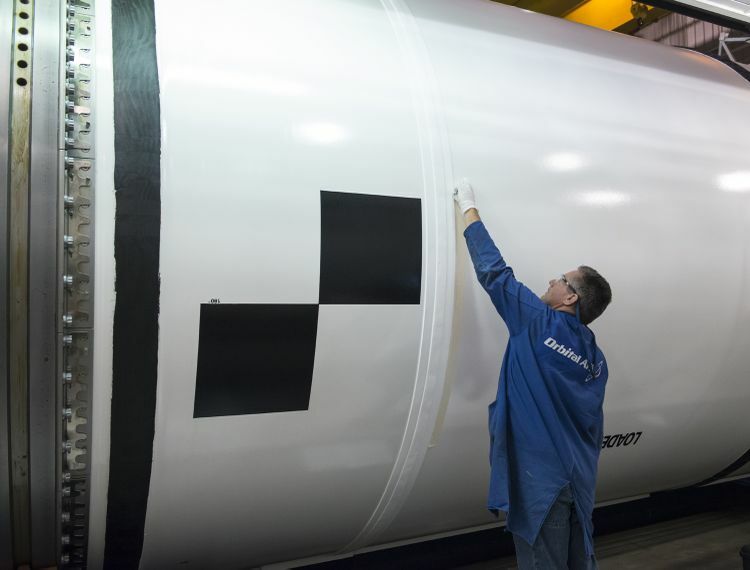 With only five segments left to finalize, Orbital ATK is on track to deliver the two solid rocket boosters for the first flight of NASA’s Space Launch System (SLS). 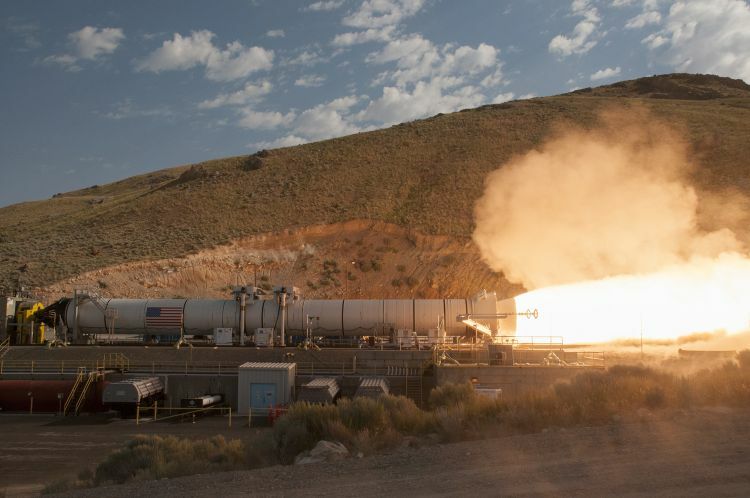 The booster segments are manufactured and tested in Promontory, Utah, and will undergo final processing and preparation for launch at NASA’s Kennedy Space Center in Florida. 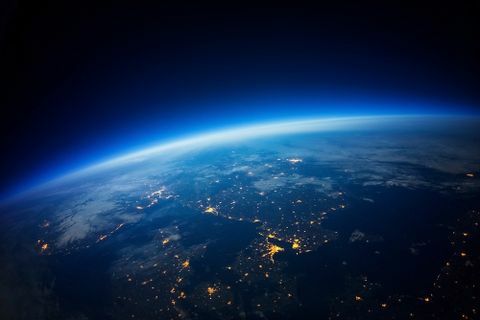 The motor segments are manufactured one by one, and each is meticulously tested before they are declared fit for launch. They are lined with insulation before they are filled with propellant in a procedure known as “casting.” The fueled segments are then x-rayed to ensure the cast was successful. The segments are then sent to the final assembly area where engineers first trim the propellant. In the forward segment they install the igniter, and a nozzle is attached to the aft segment. Finally they touch up the exterior white coating, and final touches are added including black checker-board markings, which will provide visual reference points for engineers’ post flight analysis. An Orbital ATK technician paints photogrammetric markings on one of the booster segments to provide visual reference points for better tracking of the boosters during launch and separation. With completion of each step, engineers perform numerous inspections to ensure consistency of manufacturing. Additionally, technicians take samples of the propellant during casting and test each mix to ensure quality standards are met. This grapihc shows all major components in the SLS boosters (click to enlarge). 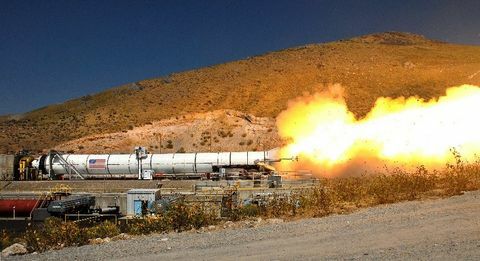 An SLS booster fires during the second qualification test (QM-2) at Orbital ATK's facility in Promontory, Utah. 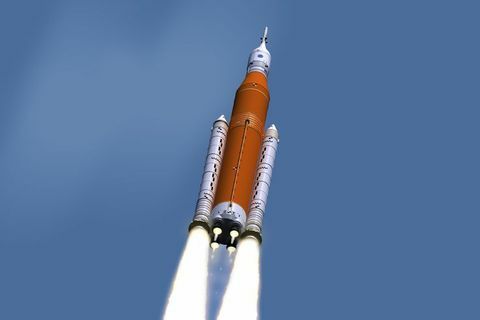 To date, all ten booster segments for the first flight of NASA’s SLS have been cast and are making their way through final processing. Five of the ten segments are fully complete and in storage, ready for shipment upon NASA’s request. All segments are on track for completion no later than November of this year. In addition to the motor segments, Orbital ATK is currently manufacturing the Aft Skirt Assemblies and Forward Skirt Assemblies at Kennedy Space Center’s Booster Fabrication Facility. These assemblies, containing the Thrust Vector Control system and Booster Avionics respectively, will be delivered to NASA in 2018 for mating with the motor segments to complete fabrication of the EM-1 boosters.